LAS VEGAS — March 4, 2016 — Donny Schatz fell out of the top five on the initial start of the FVP Outlaw Showdown presented by Dollar Loan Center on Friday night at The Dirt Track at Las Vegas, but he battled his way back to the front and took the lead with four laps remaining to score his second World of Outlaws Craftsman® Sprint Car Series victory of the season. The seven-time and reigning series champion improved on his finish of seventh on the opening night of the double-header at Las Vegas. Thursday night’s winner Joey Saldana wheeled his Roth Enterprises/HR Livestock No. 83 to the night’s overall quick time after he was the first car to hit the track in qualifying and held on while the rest of the 36-car field took times. Saldana cruised to a victory in his heat, putting him at the front of the field for before the dash inversion draw. Following an inversion draw of six, Rico Abreu started from the pole-position in his Abreu Vineyards/Alpine Star No. 24R for the six lap dash. Abreu lost the lead as soon as the green flag fell to Brad Sweet who started in the third position. Sweet dominated the dash feature, placing him at the front of the field for the 30-lap feature in his Razorback Professional Tools/Reibes Auto Parts No. 49 with Schatz and Saldana starting inside the top three. Once the green flag dropped, third place starter Saldana rocketed to the lead as Sweet settled into second and Schatz’s Bad Boy/Chevrolet Performance No. 15 slipped back to sixth. Saldana controlled the opening eight laps but never quite escaped from Sweet who completed a pass for the lead on lap nine. Sweet pulled away from the field and seemed to have the car to beat early in the feature, but Schatz continued to make progress back to the front of the field, getting to the fourth position when a caution came out on lap 10. On the ensuing restart, Schatz made the move of the race as he shot around third place Brian Brown and made his way to the inside of second place Saldana. A few laps later, Schatz had completed the pass on Saldana for second and had his sights set on the leader. With 10 laps remaining the leaders encountered heavy lapped traffic, resulting in leader Sweet changing his line to navigate the gaggle of cars. This allowed Schatz and Saldana to close in on the bumper of the leader, cutting his lead down to just a second and a half. 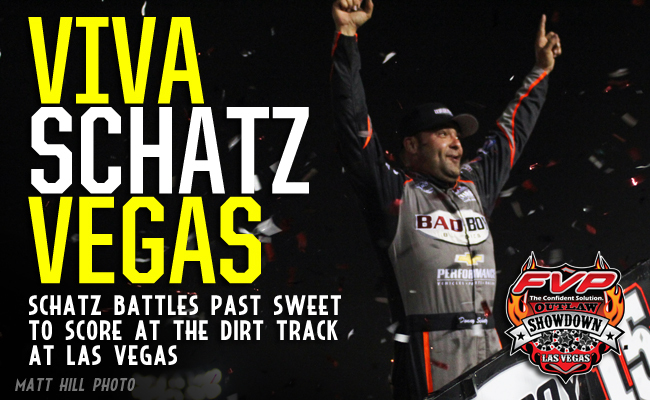 Schatz wasted no time in challenging Sweet for the top spot. Sweet had to slow and change his line as he approached slower cars allowing Schatz to complete the pass for the lead, while also opening the door for Saldana to slide by for second with just four laps left. With just two laps remaining, a caution came out, setting the race up for a green-white-checkered finish between three of four different winners in 2016. On the restart, Sweet tried to slide his way around Schatz and Saldana to steal the win away but came up just short, as he fell back to the third position. Schatz held off Saldana through the final two lap shootout as Saldana finished the double-header at The Dirt Track at Las Vegas Motor Speedway with a first and a second place finish. “We did everything right tonight,” Saldana said. “Everything was going good and there was a point where I thought I might have a shot, and then it went away because these guys are so tough and so good and they don’t make a lot of mistakes. After leading the majority of the race, Sweet settled for a third place finish, extending the Kasey Kahne Racing with Mike Curb podium streak. “We got the lead and had a really good car,” Sweet said. “We just made too many mistakes and you can’t do that with Donny breathing down your throat, then Joey got by me too. There were just too many driver errors. The World of Outlaws Craftsman Sprint Car Series heads south to Phoenix for the first time since 2009 for the inaugural Napa Desert Shootout at Arizona Speedway in Queen Creek on Sunday. RACE NOTES: Donny Schatz becomes only the second repeat winner of 2016…Kasey Kahne Racing extends its podium streak to one car inside the top three in all seven events…Jason Johnson picks up his second KSE Hard Charger Award of the season… Joey Saldana became the fifth different driver to pick up a quick time award so far this season. CONTINGENCY WINNERS – MSD Ignitions ($25 cash): Donny Schatz; MSD Ignitions ($50 cash): Donny Schatz; Penske Shocks ($50 cash): Paul McMahan; Mobil 1 ($50 cash): Jason Sides; JE Pistons ($50 cash): Shane Stewart; VP Racing Fuels ($50 cash): Jason Johnson; Edelbrock ($50 cash): Jason Johnson; Comp Cams ($50 cash): Jason Johnson; Cometic Gasket ($50 cash): Kerry Madsen; Super Flow ($50 cash): Paul McMahan; Craftsman ($100 cash): Rico Abreu;Sweet Manufacturing ($50 product certificate): Brad Sweet; KSE Racing Products ($100 product certificate): Jason Johnson;Comp Cams ($50 product certificate): Donny Schatz; Mobil 1 (20% off Mobil1RacingStore.com): David Gravel; JE Pistons (Set of Rings): Jason Sides; JE Pistons (Set of Rings): David Gravel.